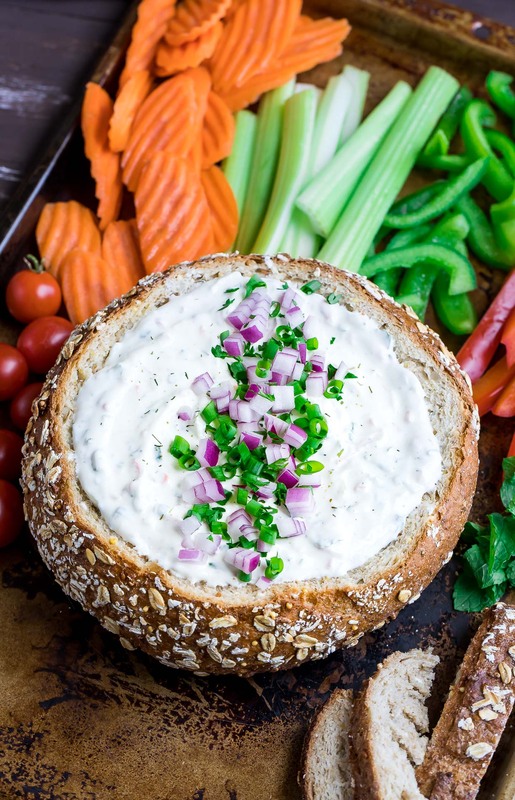 This party-perfect Chilled Veggie Dip is served in a bread bowl with crunchy veggies for a tasty snack that will have your guests coming back for more! I’ve been working on building up my arsenal of dips and snacks that I can whip up in advance for parties, potlucks, game nights, and gatherings. This deli-style veggie dip actually tastes best made the day before — jackpot! — and saves me precious prep time the following day. For best results, make this delish dip the night before. The flavors work their magic in the fridge for a party perfect snack the following day! 1 fresh round loaf of bread from the bakery of your local supermarket, or your favorite stand alone bakery. Cut the top off (chop it for dippers) and hollow out the center - easy peasy! 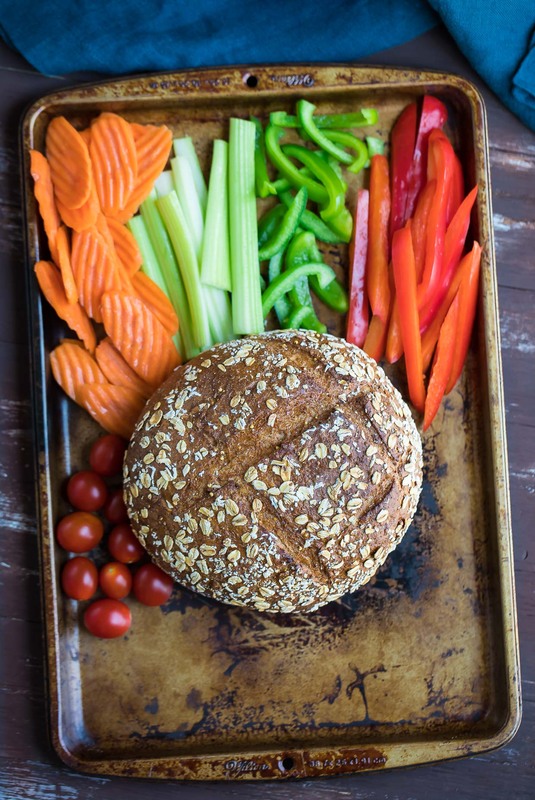 You can even bake a fresh loaf yourself (ummmm bake me one too?!) and use it for this recipe. and anything your heart desires! Chop your veggies and squeeze the zucchini dry with a few paper towels to remove excess liquid. Pop it in the refrigerator overnight and serve the next day with all your favorite dippers. Dip will stay fresh and delicious for up to 4 days in the fridge. Serve it in a bread bowl (see above for instructions), in hollowed out bell peppers, or your favorite bowl. Enjoy! I've made this dip a few times now and I have to admit that it's not a whisk-together-and-faceplant kind of dip. The real deliciousness happens when the herbs, seasoning, and veggies get up close and personal in the fridge. Trust me, it's exponentially better if you let it sit overnight. It's science. Delicious, edible science! Ran out of Greek yogurt? No worries! You can use a little extra mayo and sour cream to make up the missing cup. Easy peasy! Big thanks to my friend Jill for sharing her well-loved cookie sheets with me for all my crazy food photography needs. I love a good distressed baking sheet… they’re just so fun and textured and full of life. Is that weird to say? Probably. Phenomenal! 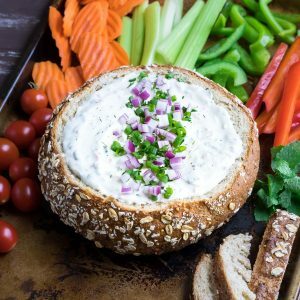 As I mentioned before, the little kiss of mayo in this recipe adds a welcome layer of savory richness to the dip that I just love. Ive tried making versions with only sour cream and yogurt before but I have to admit that even a 1/4 cup of mayo makes a world of difference in the base. There’s something scientific at work there but it’s totally above my head, haha! The garlic-dill-onion combo here seriously shines through and puts store bought tubs to shame! It’s also 100x healthier than store bought dips because you get to control each and every ingredient — no strange sketchy fillers here! Ga-ga for garlic? Feel free to take the flavor to the next level with extra garlic. You can even use a combination of freshly sautéed or roasted garlic with the garlic powder and really take things over the top. The safest bet to test the waters with extra seasoning is to try the dip the next morning and add any extra goodies you’d like to the mix. The flavors for sure amplify in the fridge and the dip thickens in the process too. Love it so! THIS. 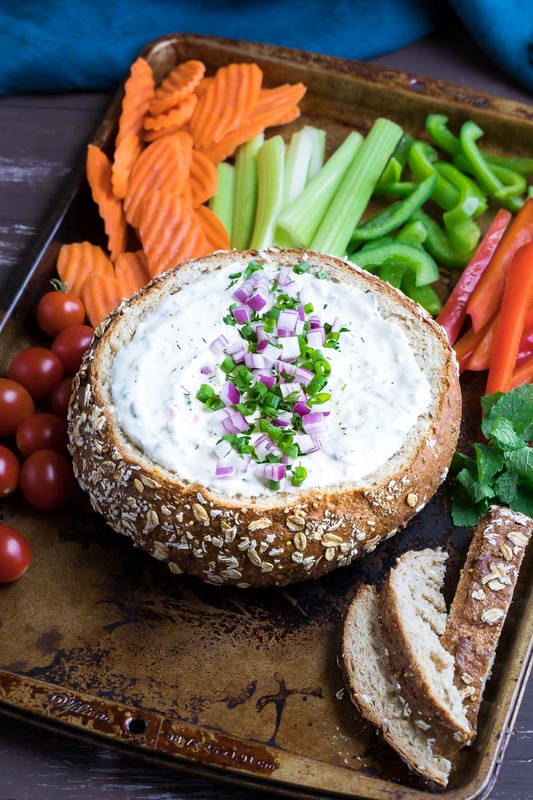 Healthier twist on your normal run-of-the-mill ranch or onion dip recipe. Amazing cool flavor that is addictive. Loved this with bread and carrot chips as dippers. I could totally see myself spreading this on cucumber sandwiches too! Did you bake the bread bowl? If so, what is the recipe and how did you do it? It looks fun and delish. Thanks! Just made, but couldn’t wait for it to chill overnight so I added a little more seasoning to a cupfull to eat now! Really tasty!